A job transfer usually is a good thing. Hopefully the transfer signals a promotion as you take your career a step further up the ladder, bringing about new and fun challenges in the workplace. 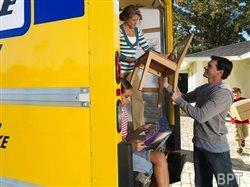 But the transition itself is often not easy, especially if it involves moving your home and family to a new location. Businesses often give transferred employees less than two weeks (11 days) to accept a transfer offer and once accepted, an average of 33 days to move and report to the new job, according to Worldwide ERC, a professional association for workforce mobility. That isn’t much time to find a new home, put the old home up for sale or subleasing and plan a move that could be across town, across state lines or across the country. * Your company – Before you accept the job transfer offer, check with your human resources department on what services or financial compensation your company offers. Many companies outsource relocation services or cover selected services like providing rental moving trucks for employees. Be aware that the average cost of shipping household goods for a domestic transfer was around $ 12,459 in 2012, according to Worldwide ERC. * Truck rental – Much of the moving process involves the transfer of your household goods. Truck rental companies like Penske help to make this process much easier. For example, Penske, which is a member of Worldwide ERC, has a dedicated customer service and sales team within its existing call center to serve the specialized needs of employee relocations. The company also added services like moving labor to help customers load and unload the rental trucks, new self-storage options for movers and customized billing options for each of these services to make the corporate transfer much smoother. * House hunting – Searching for a new home could be the most stressful part of relocating. Many employees will opt for temporary housing like apartments or extended-stay hotels for the first couple months of the transfer. This allows them to get a feel for the community and take the time to review homes for sale. However, if you prefer to purchase a home right way, contact the human resources department at your new location to ask for real estate agents referrals. Also take your search online. Between MLS listings with photos and online mapping tools, you can narrow your search quickly to preferred homes, allowing you to make an appointment once with your real estate agent to tour the homes and hopefully make an offer. * House selling – On the other end of the spectrum, you also have a home to sell. Many homeowners are opting to hire a management company and rent out the home, with the intent to sell in the future once they have their life organized in the new location and have the time to list the home with a real estate agent. Management companies handle the review of rental applicants, the background checks, collect the rent and take care of any emergency maintenance concerns that might occur, allowing the homeowner to concentrate his energies on the new job. The job transfer process may feel overwhelming, but with these resources available to assist you with the transfer, you’ll find yourself quickly settling into the new office and digging into the challenges of the new job.